Dr. Lindstrand handles all her own emergencies. Please be considerate and page her only if you have an urgent matter. Call the clinic phone number and the answering machine will give you a cell number. Please note that there is an additional fee for after hour visits. All cats seen on emergency must be patients that have been seen within the last year, neutered , and current on rabies/distemper vaccinations. Hospitalized patients receive intensive monitoring and expert nursing care throughout the day. Normal hospitalization is charged by the night. Our staff is on TLC watch, and every time they walk by a cage, they are to open the cage door, pet and speak softly to the patient. This has been shown to reduce stress and speed up recovery. We have large, roomy cages and kitty condos available. Our boarders also receive TLC watch and the staff are encouraged to play with the cats. The cats are housed in our boarding area and kept separate from the hospitalized cats. Cats are weighed every day to be sure they don’t lose any unintended weight. Boarding is charged per night. We require all boarders and patients to have a current rabies and distemper vaccinations. Feline leukemia and/or FIV testing is also highly recommended. We feed all natural, holistic diets, canned and dry. If your cat is currently on specialty food, such as those for urinary tract, kidney or cardiac care, please let us know. Specialty diet food can be supplied by the clinic for an extra fee. We encourage you to bring your kitty’s favorite toys, a familiar blanket or a towel, and other items from home. We offer lion cuts (which are a shave down). These usually require sedation and the veterinarian’s supervision. Routine herbal and fragrant baths are available with blow drying and combing. Mats can be removed by combing or shaving. Pedicures (nail trims) are free with the grooming. Microchips are the size of a grain of rice and are injected under the skin of the pet and remain there for the life of the animal. Scanners are provided to our local animal shelters and veterinary clinics. Animals are scanned when they first come into a shelter and the microchip emits a number. The shelter than calls an 800 number and gives them the microchip number. The registry will call the owner to let them know their pet’s location. Any animal can be microchipped. 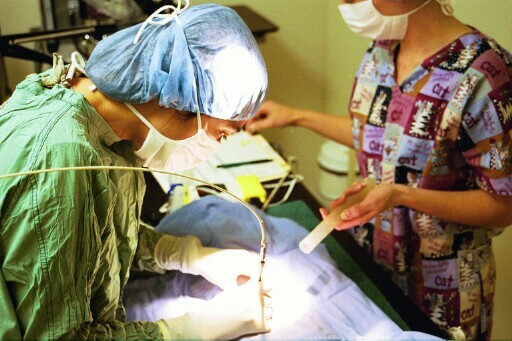 All of our surgeries, including spays, neuters and declaws are done with the laser. Laser surgery involves less pain, swelling and bleeding for your cat, as well as an added peace of mind for you! It’s also been proven that healing times after procedures are reduced significantly. Brochures detailing laser surgery are available in the front reception area. House calls are intended for people who have difficulty getting to the office or have several cats. There is an additional charge for this service.